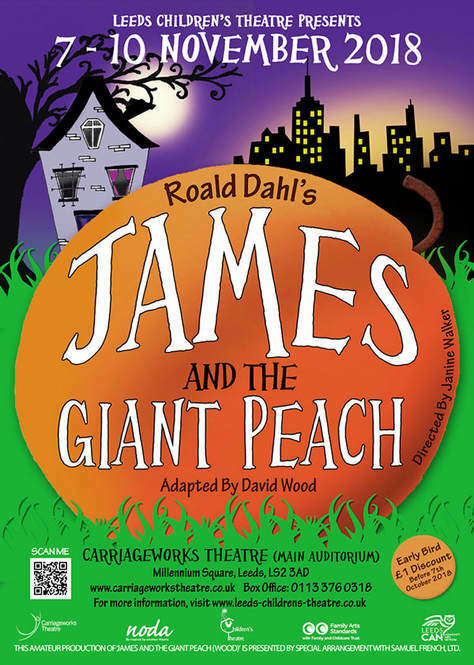 HOW TO BOOK TICKETS FOR "JAMES AND THE GIANT PEACH"
​James lives with his Aunt Spiker and Aunt Sponge, the most mean and horrible Aunts in England. They make him work and slave and never let him play with other children. Then one day he meets a mysterious old man who gives him a gift … a bag of magical crocodile tongues. When James accidentally spills the bag near an old peach tree the most amazing things start to happen – and James sets out on the adventure of a lifetime with the most remarkable group of characters you could ever meet! ​Join us as James, the Old Green Grasshopper, Miss Spider, Centipede, Earthworm and Ladybird emerge from the peach and tell the people of New York the tale of their fabulous adventure. Leeds Children's Theatre will be supporting the Roald Dahl Nurses charity with our bucket collections during performances of James and the Giant Peach. Ronald Dahl children's nurses provide care and support to seriously ill children and their families who are living with a variety of serious, rare and undiagnosed conditions. Based in hospitals across the UK, they are specialists in their fields. The Box Office will charge a fee of £1 for postage if you wish to have your tickets mailed out. The bucket collection, during performances of The Demon Headmaster for Martin House Children's Hospice, raised £153.75 for the charity. Thank you to our collectors, everyone who donated. ​There will be no Saturday Workshop on 10 November as we are performing in theatre this week. ​This year the final Saturday Workshop before the Christmas break will be on 15 December. Members of Leeds Children's Theatre please note that your play reading and auditions for our next production will take place Tues 20, Weds 21 & Thurs 22 November 2018, from 7pm. We are staging Hansel and Gretel, to be directed by Ian Goodison. Performances will be at the Carriageworks Theatre during w/c 25 March 2019. Guild Awards Evening 2018 - Congratulations to Jane, Bernard, Molly, Harley and Dan who were all nominated for awards this year. 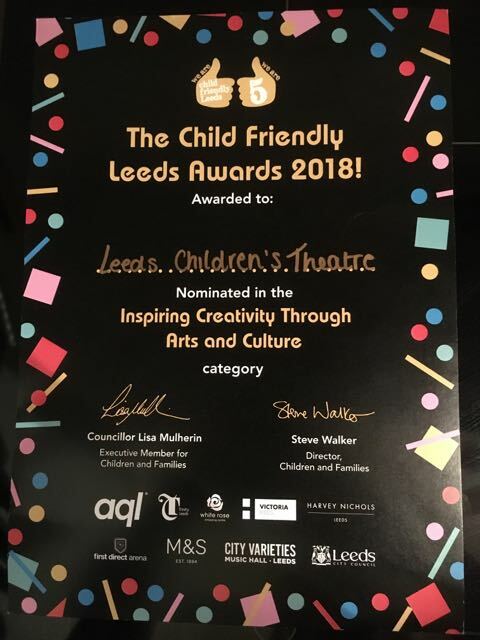 The event took place at the Carriageworks Theatre on Saturday 1 September, and we're delighted to report that Molly Goodison won "BEST FEMALE SUPPORTING PERFORMANCE IN A DRAMATIC PRODUCTION" for Goodnight Mister Tom. Our regular monthly workshops for members aged 13+ started on Friday 16 February 2018, hosted by Tony, Manda and James. The cost is £3 a session (pay on the day). Although these are usually held on the 3rd Friday every month there are days when the theatre can't offer us a room, so please check first. Thank you to everyone who helped with our pop-up workshops at this year's St Gemma's "Family Fun Day and Classic Car Show" (Temple Newsman Saturday 18 August). ​Many thanks to everyone who turned up to help at Kirkstall Festival this year (14 July). We raised over £100 for the society - huge thanks to our face painters and members who donated books. 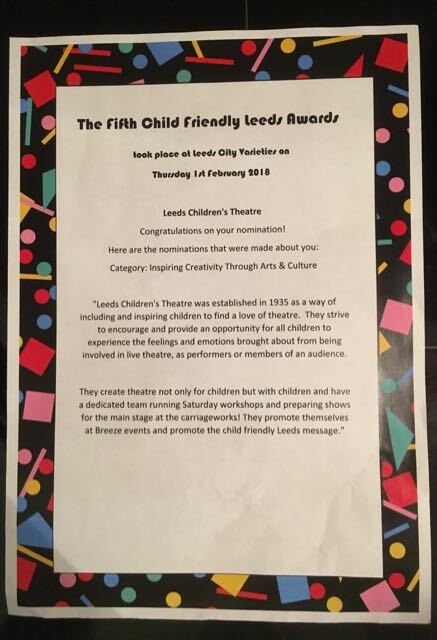 ​Awarded to: Leeds Children's Theatre. Nominated in the Inspiring Creativity Through Arts and Culture category.